- This morning the passenger liner Lusitania approaches the Irish coast en route to Liverpool, carrying 1265 passengers and 700 crew. 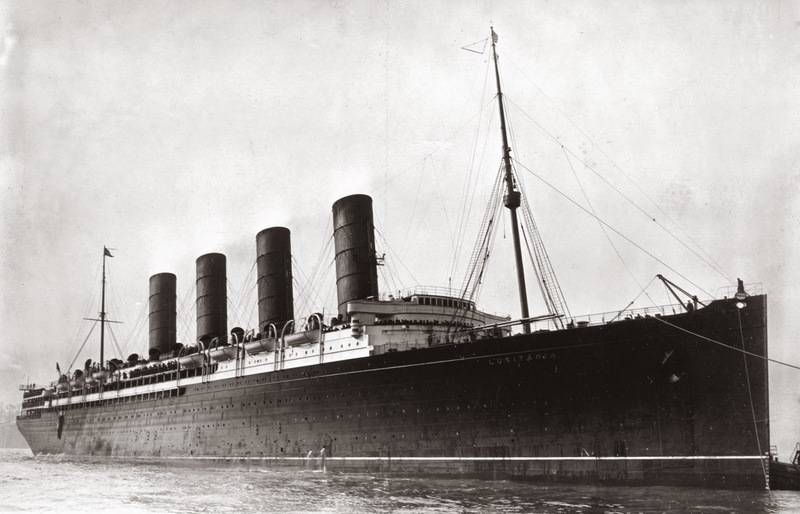 Built in 1907, on completion Lusitania and its two sister ships had been the largest and fastest ocean liners in the world; though in size they were surpassed by Titanic and Olympic, they remain the fastest, capable of speeds up to twenty-five knots. The construction of Lusitania had been subsidized by the Admiralty to allow for a wartime transformation into an armed merchant cruiser, but though this option has been briefly considered it was decided to leave Lusitania in passenger service. Indeed, by 1915 it is the only large liner still carrying passengers across the Atlantic. The Cunard passenger liner Lusitania. Travelers intending to embark on the Atlantic voyage are reminded that a state of war exists between Germany and her allies and Great Britain and her allies; that the war zone includes waters adjacent to the British Isles; that in accordance with formal notice given by the Imperial German Government, vessels flying the flag of Great Britain or any of her allies are liable to destruction in those waters and that travelers sailing in the war zone on ships of Great Britain or her allies do so at their own risk. The notice had been published by German embassy officials in the United States, prompted by their belief that Lusitania was carrying munitions as well as passengers to Britain, which made the liner a legitimate target in light of the policy of unrestricted submarine warfare. With respect to Lusitania's current voyage, they are correct: among its cargo are 1248 cases of 3-inch artillery shells and 4927 boxes of rifle ammunition. In attempting to dissuade passengers from embarking on Lusitania, the advertisement hopes to prevent American lives being lost should it be sunk, knowing full well the outrage that would likely ensue should American die at the hands of a German submarine. That is, however, exactly what occurs. U-20 is also off the south Irish coast today, and at 120pm sights a plume of smoke on the horizon. Submerging, its captain watches as a giant steamship comes into view, and sets a course that will intercept the liner ten miles from shore near Kinsale. Aboard U-20 is a civilian merchant marine advisor to assist in the identification of potential targets. Peering through the periscope, the advisor concludes that it is either Lusitania or Mauritania before them, and based on the the description of them in copies of Jane's Fighting Ships and Brassey's Naval Annual he has with him concludes that the ship is an armed merchant liner used for ferrying soldiers. The captain of U-20 decides that this is a legitimate military target under unrestricted submarine warfare, and at 210pm fires a single torpedo from a range of 800 yards. The torpedo runs true, striking Lusitania just aft of the bridge, and its detonation is shortly followed by another explosiion, the origins of which remain a mystery to this day. The liner immediately begins to list to starboard, and within minutes it becomes impossible to lower lifeboats, those on the starboard side swinging away from the ship while those on the port side crash and break up against the hull. After a mere eighteen minutes Lusitania sinks below the waves, and only six of its forty-eight lifeboats are afloat. Hundreds struggle in the water, and for many rescue will not come in time. First on the scene is the old armoured cruiser Juno, but just as it is about to commence rescue operations the Admiralty, recalling the fate of the 'live bait' squadron when they stopped to help a torpedoed warship, orders it to return to port. It will be several more hours before fishing trawlers arrive to begin plucking the living and the dead out of the water. In total 1201 passengers and crew perish in the sinking of Lusitania, a number which includes 94 children and 35 infants. Indeed, among the first of the dead brought ashore are children and infants, and photographs of their bodies, circulated in newspapers ostensibly to allow relatives to identify them, provoke sharp outrage in Britain and elsewhere. This is precisely the disaster that Chancellor Bethmann-Hollweg had warned about just yesterday: mass casualties resulting from the sinking of a passenger ship. Perhaps most crucially among the dead are 128 Americans, and the question now arises as to the response of President Woodrow Wilson. - For the past four days artillery of the French 10th Army has been pounding the German line between Arras and Lens, in preparation for the offensive that was scheduled to begin today. However, rain and poor visibility forces a postponement of the assault for two days, during which the artillery bombardment will continue. The British also postpone their supporting attack to the north. - As the Russian army had retreated through Courland over the past week, the navy had insisted that the naval port of Libau and its fortifications be held. The army has disagreed, and in the ensuing confusion one set of defenders evacuated Libau, destroying its telegraph link, while another set moved in to defend the port. Taking advantage of the mess, the German 3rd Cavalry Brigade, aided by several infantry battalions, is able to capture Libau today without meeting serious resistance. The 1500-man Russian garrison surrenders, and the coastal guns 'protecting' the port turn out to be dummies. - The German 11th Army continues its advance eastward, with 119th Division reaching Rymanow securing a crossing of the Wislok River at Besko. On the Russian side, Grand Duke Nicholas meets with Generals Ivanov and Alexeyev in a railway car at Cholm. A suggestion by Ivanov's chief of staff to pull 3rd Army back across the San River is rejected outright, and instead only minor withdrawals are to be permitted. Two divisions - 13th Siberian and 63rd - are dispatched to reinforce 3rd Army, and XXI Corps is to go into reserve near Sanok, and just before midnight General Dimitriev issues orders for it to prepare a counterattack in the direction of Besko and Rymanow, in an effort to throw the German advance off-balance. Meanwhile, south of Dukla most of the infantry of the Russian 48th Division, which has taken to the woods to avoid the enemy, are taken prisoner by the Austro-Hungarians, though smaller bands will remain for some time. - This morning the British 42nd Division's 127th Brigade comes ashore, which General Hamilton orders to join a resumption of the offensive towards Krithia. This attempt fails to make progress, but a second mass attack is ordered at 430pm. This too gets nowhere; indeed, so heavy is the Ottoman fire that most infantry go to ground almost immediately after leaving their trenches, ironically ensuring that British casualties today, at eight hundred, are comparatively light. - Today the Japanese ambassador presents a revised version of the Twenty-One Demands of January 18th, 1915, to the Chinese government. The new demands are milder in tone than the original, and in particular group five, comprising the most aggressive points, has been dropped entirely. In part this is due to diplomatic pressure from the British, who do not wish to see Japan expanding its influence too greatly in China, to the detriment of Britain and the other European powers. However, the 'revised' Twenty-One Demands in practice embody the minimum deemed necessary by the Japanese cabinet, and by giving the appearance of comprising by reducing their original demands they make it more difficult for the Chinese to reject the rest.